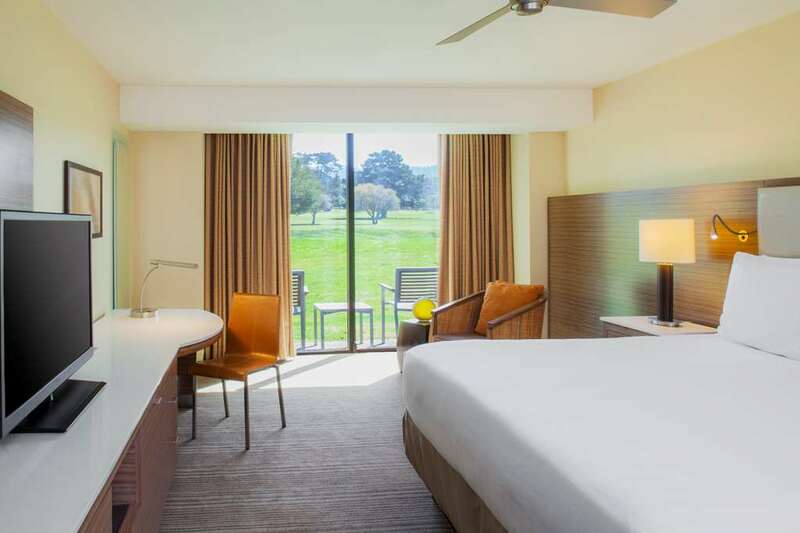 With 550 deluxe guestrooms and suites and over 40,000 square feet of newly renovated meeting and event space, the Hyatt Regency Monterey Hotel and Spa is the most complete hotel destination on the Monterey Peninsula. Nestled in 22 acres of Monterey Pines, the Hyatt Regency Monterey provides the quintessential Monterey experience in a location offering guests close proximity to downtown Monterey, Monterey airport and easy access to the Peninsulas top attractions like Cannery Row, Fisherman's Wharf, Monterey Bay Aquarium, Carmel-by-the-Sea and Pebble Beach. The property offers world-class amenities including two outdoor swimming pools, whirlpools and fire pits, full service tennis facility, state-of-the-art health club, new 12,000 square foot Marilyn Monroe Spa and salon and Pebble Beach Companys Del Monte Golf Course. Also enjoy all three of Hyatt Regency Montereys unique restaurants and lounges: TusCA Ristorante offers diverse Italian and California cuisine in a beautiful show kitchen setting. Knuckles Sports Bar has been voted #1 by the locals for 10 years straight with 24 HDTVs, 20 draft beers and a full menu with burgers, wings, pizza and more. Fireplace Lounge offers a casual indoor/outdoor environment perfect to enjoy either lunch or dinner and unwind with a glass of wine while listening to live jazz on the weekends. TusCA Ristorante: Located adjacent to the hotel lobby with views of the Del Monte golf course, the new TusCA Ristorante features wood-burning oven cooking, specializing in home-style Tuscan dishes prepared with the freshest availble local ingredients. Also features a wine and cheese bar. Knuckles Sports Bar: Decorated in sports memorabilia and photos, Knuckles offers comfortable fun surroundings. Featuring incredible "Knuckles" sandwiches and your favorite beverages. Fireplace Lounge and Coffee Bar: Located in the hotel lobby, the new Fireplace Lounge provides a relaxing fireside ambience. Offers cocktails and light appetizers with indoor and outdoor seating. Live jazz on the weekends, the best jazz on the peninsula. Open daily at 6:30am. Located on the beautiful Monterey Peninsula adjacent to Pebble Beach Company's Del Monte Golf Course and nearby Naval Post-Graduate School. Located on 22 acres of beautifully landscaped grounds surrounded by trees.